Naheed Nenshi pulled off a stunning win last night and is to become Canada’s first Muslim mayor. Nenshi won about 39% of the vote, compared to 30% for McIver and 26% for Higgins. Turnout was relatively high at around 50% of registered voters turning out to vote. Today is election day in municipalities across Alberta. Ontarians, Manitobians, and Islanders head to the polls next week to select their municipal and regional governments. It seems to me that attention to municipal politics has been greater this go around in large part to the campaigns in three of Canada’s largest cities: Toronto, Calgary, and Ottawa. Today I give my two thoughts on the mayor’s race in my former hometown of Calgary, AB. No incumbent mayor running for re-election has ever been defeated in Calgary. With incumbent Dave Bronconier deciding to retire as Chief Executive of Canada’s one-time boom town, the race was wide open to become the city’s next mayor. Early on, over a dozen serious or somewhat serious candidates put their name forward. The most surprising was former CTV local news anchor, Barb Higgins. Higgins, a widely known, yet politically untested candidate took the early lead in the polls – thanks in large part to her overwhelming name recognition. Her main competition came from long-time councillor Ric McIver. Known on council as “Dr. No”, McIver is the populist and conservative candidate in the race with a platform and record akin to the Reform Party or Wildrose Alliance. He’s been a strong advocate for transparency and spending controls at city hall and is respected in many circles for his positions. It seemed early on, in a city known for its conservative leanings, that McIver was a shoe-in. But once again, since so few voters pay much attention to the campaign until the last few weeks, a surprise was not out of the question. Since September, all the momentum in the race has been behind Mount Royal University business professor and former business consultant Naheed Nenshi. Early polls had him in single digits, but thanks to an effective social media campaign and perhaps a desire for real change that could effectively manage city hall (Higgins made a few gaffes that made if seem she was not up to the job), the most recent poll has it a three way race. Calgarians are aching for change after a turbulent few years at City Hall. While Higgins seemed a reasonable and safe vessel for change early on, she has seemed ill-prepared or ill-suited for the job (watch her interview on breakfast television). Instead, Nenshi persevered and seems to have effectively positioned himself as a change agent that Calgarians can trust. McIvor would certainly be a change – but despite a long campaigns, 60% of Calgarians don’t seem keen on him becoming the next mayor. The result will ultimately depend on turnout. 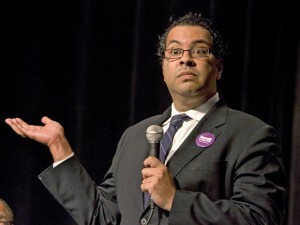 Some have suggested that Nenshi’s fate will be determined by whether his youngish base of support shows up to vote. Advanced voting this time was significantly higher than in 2007 which may suggest he’s been successful at pulling his vote. Today, the Calgary Sun surprised everyone by endorsing Nenshi and if Calgarians do elect him their next mayor they will finally throw off the stereotypes the city has earned in the past for being a regressive, ultra-conservative hub. The Sun’s endorsement may give Nenshi the final push over the finish line. The fact that Nenshi may become Calgary’s mayor and Ford may become Toronto’s mayor is a role reversal most people wouldn’t have considered. But those of us (Calgary Grit wrote an open letter to Toronto recently) who have lived in Calgary know that the city is as diverse, tolerant, and open-minded as any in Canada.